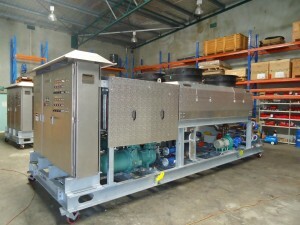 These chillers are designed to operate in very high ambient temperatures. 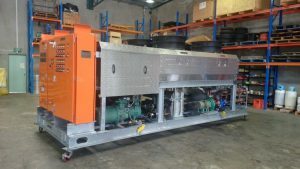 They are provided with a separate chilled water circuit which incorporates a buffer tank to prevent cycling of the compressors in low duty conditions. They have electronic expansion valves and variable speed condenser fans. They also have two refrigerant systems and 2 controllers, so if any part of a refrigerant system fails the other system will still operate. 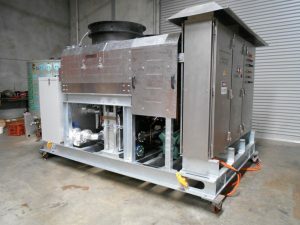 These chiller are designed to operate in very high ambient temperatures. They are provided with a separate chilled water circuit which incorporates a buffer tank to prevent cycling of the compressors in low duty conditions. They have electronic expansion valves and variable speed condenser fans. They also have two refrigerant systems and 2 controllers, so if any part of a refrigerant system fails the other system will still operate.